Transport your four-legged hunting buddies to and from the field – as well as your guns, decoys and other outdoor gear – in comfort and style with Owens Products Hunter Series Dual-Compartment Tall Dog Box with Top Storage. 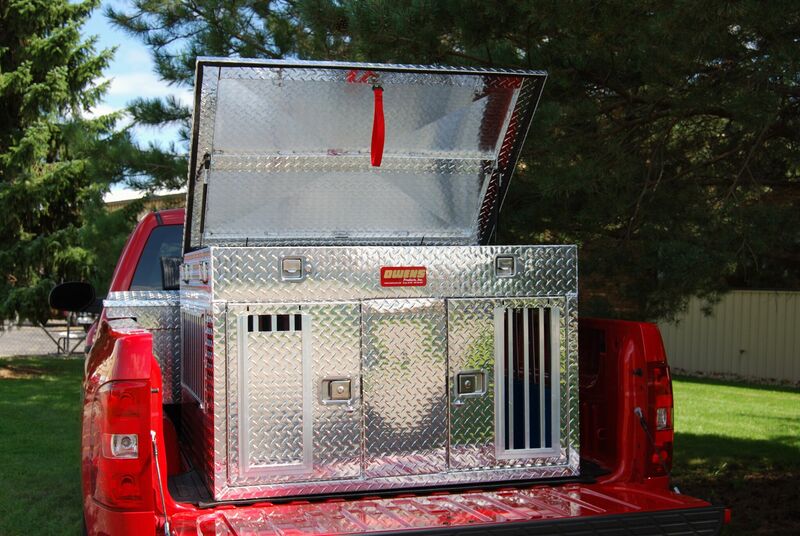 Ideal for traveling with taller breeds, this large, lined dual-compartment dog box features a rugged diamond-tread aluminum construction, oversized 4-season vents that promote maximum air flow, locking latch doors and storm covers for all vents. Handy full-length top storage area keeps must-haves secure while you're on the go and the integrated pull strap makes it a breeze to close. Convenient spring-loaded carry handles. Made in USA. 45”L x 48”W x 32”H. Dog compartment: 24”H x 24”W x 44”D. Storage: 6”H x 48”W x 45”D.